If you live or work in the New York metro area you might want to consider attending today's Connecticut Maritime Time Association luncheon. The guest speaker is James Christodoulou, CEO of Industrial Shipping Enterprise Corporation. He's the guy you saw on television as the piracy expert during the Maersk Alabama incident. Why is he an expert in piracy? Perhaps because Mr. Christodoulou successfully negotiated the release of the M/V Biscaglia. His topic is the human, operational, and financial impact of piracy. It should be an interesting talk. What? Your not a member of the CMA! Membership (link to pdf) is inexpensive and the networking is priceless (disclaimer- Amver is a member). You can rub elbows with some amazing people at CMA events. The CMA is taking the luncheon on the road in June to Washington, DC on June 4th at the Army and Navy Club and then back to Connecticut on June 18th where Rear Admiral Allen Worley, Superintendant of the U.S. Merchant Marine Academy is the scheduled speaker. What's your best CMA story? On the heels of a successful Amver awards ceremony in Washington, DC we are happy to bring you the latest list of new Amver participants. Each of these ships have agreed to voluntarily report to the Amver program and, if necessary, divert to assist a fellow mariner in distress. And now, the new participants! Congratulations to the new enrollees. We look forward to having you as part of the Amver family. A hat tip to the crew of the NOAA ship Gordon Gunter who sent along this photo of them proudly displaying their Amver pennant. Pictured from left to right are LTJG Ryan Wattam, LT Hector Casanova, NOAA fisheries biologist Carrie Horton, LCDR Brian Parker, and ENS Michael Robbie. In the words of the Gunter crew, "Amver, we don't leave port without it!" Congratulations on earning your Amver pennant and thank you for sending the picture. What about your ship? If you send us your photo we will be happy to post it to the Amver blog! Turnout was great for the first Amver awards ceremony in the United States since the late 1990s. USCG Vice Commandant Vivien Crea, Maritime Administration Acting Deputy Director James Caponiti, Rear Admirals Brian Salerno and Jim Watson, along with USCG Chief of Search and Rescue Captain David McBride and Amver Director Benjamin Strong lent their support to the Amver awards ceremony. Susan Clark, of the Maritime Administration, sang a verse from the Mariner's Hymn before a moving video was debuted by the Amver system. USCG Vice Admiral Vivien Crea gave a personal and thoughtful address to the attendees. Amver is proud of the 81 U.S. companies earning Amver awards for their dedication to safety at sea. This dedication is demonstrated not only by their participation but by their call to action. One of the vessels participating in Amver and called upon to assist was the Maritime Administration's training ship Golden Bear, home ported at the California Maritime Academy, which rescued 2 sailors August 17, 2008. The Amver ceremony would not have been a success without the involvement of Mr. Will Watson. Thank you, Will, for your efforts in bringing the Amver awards to Washington, DC. In addition to Mr. Watson, sponsors Blank and Rome, Inmarsat, Lockheed Martin, NAMMA, and NAMEPA also helped make the awards a reality. The media sponsors were Lloyd's Register Fairplay and Safety at Sea International. Thank you to everyone who participated. We look forward to returning to the National Press Club next year! Are you coming to the U.S. Amver Awards Ceremony in Washington, DC today? Information on the ceremony can be found here. Besides U.S. Amver award recipients guests such as United States Coast Guard Rear Admiral Brian Salerno and United States Coast Guard Vice Commandant Vivien Crea will be attending. Stop by to pay tribute to the many U.S. shipping companies participating in the Amver system dedicated to safety at sea. Interested in learning more about the Amver system? Check out Mad Mariner's web site for a link to the Amver podcast and hear all about our search and rescue system. Do you have a podcast or website? Would you like to learn how Amver saves lives or uses commercial ships to coordinate rescues at sea? 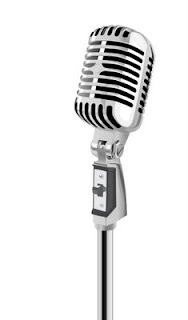 Drop a line to Benjamin Strong for interview or speaking requests. Amver is always happy to share stories of how search and rescue authorities can increase their search capabilities with Amver. Did you listen to the interview? Tell us what you think! Despite changes in vessel tracking technology shipping companies recognize the value of enrolling in, and reporting to, Amver. As technologies do improve and provide a clearer picture of what is out on the water Amver remains relevant. In fact, Amver contributes to search and rescue by often identifying vessels not otherwise tracked. Don't look for Amver to disappear anytime soon. Now, this week's newest Amver members. 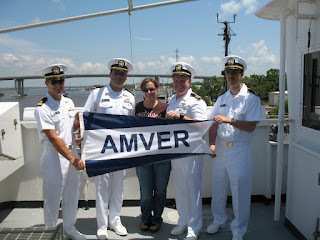 Would you like to enroll your vessels in Amver but you don't know how? Read our previous post on how to enroll your ships and your vessel's names will be highlighted in an upcoming Welcome Wednesday post. Merchant mariners, chaplains from the Seamen's Church Institute, and a United States Coast Guard honor guard met at the American Merchant Marine Memorial to remember those lost at sea and pay tribute to the men and women who work in, or on, the sea. Amver depends on merchant mariner participation from around the world to ensure no call for help goes unanswered and we were honored to attend the observance. There are plenty of ways for mariners to learn safe boating and sailing techniques. The Coast Guard Auxiliary offers these courses along with vessel safety checks. But what happens if you end up in the water? There you are, sitting in your life raft hundreds of miles from shore. What happens after the rescue? That's the point of this post, to help you survive the rescue. Before leaving the dock you need a properly registered 406 EPIRB on your vessel. If you are a U.S. sailor you can register your beacon here. If you are an international sailor and your country doesn't have a domestic registry you can access the international beacon registry here. Here are 15 other things to consider before, during, and after a rescue. Prepare a small waterproof bag with the following items. Make sure the bag is accessible and small enough so you can take it with you if you need to be rescued. A copy of your passport. This will help State Department officials get you new documents if your passport is lost. A copy of a second ID. A second ID helps immigration officials if you are taken to a foreign port. A copy of your shot record. If you are rescued by a commercial ship and taken to a foreign port you may be required to show your immunization record. A copy of a credit card. Make sure you copy the front AND back of the card. Depending on the card's services you may be able to request cash or other assistance. Prepare a sail plan. Make sure the people identified as emergency contacts in the beacon registry have a copy of it. Rescue officials will ask things like last port of call, next port of call, satellite phone numbers, email addresses of the sailors/boat, and vessel identification. Consider attaching a photo of the vessel with the sail plan. Emergency contacts should be able to email the sail plan and vessel photo to search and rescue authorities. Activate your EPIRB. Your EPIRB will alert rescue authorities you are in distress and identify your location. Follow search and rescue authorities directions. 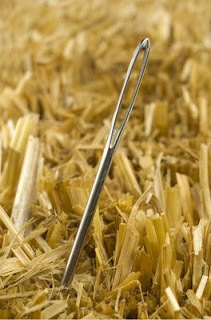 Know that resources are coming to find you. A commercial ship participating in the Amver system may be dispatched to rescue you. Moving from a small vessel to a large commercial ship requires careful attention to detail. Commercial shipping crews are trained for these situations. It is critical that survivors follow directions carefully to ensure a successful rescue. The ship that rescued you may not take you to the closest port, rather their next port call. 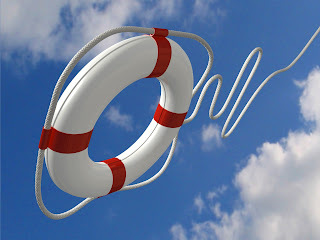 Rescue authorities may contact your next of kin on your behalf. Rescue authorities will likely contact the rescue vessel's next port of call. Immigration and customs officials need to know you will be disembarking. If you are a U.S. citizen the State Department will be notified of your pending arrival in a foreign port. State Department personnel will help you get new documents, contact your family or friends in the United States, and help you arrange lodging and transportation home. Repatriation costs are your responsibility. The United States will not pay for the costs associated with your rescue or return home. There should be no cost for the actual rescue. Have you been rescued? What was your experience? What would you suggest we add to the list? Tell us your thoughts. The United States Coast Guard, in response to increased piracy attacks, has issued a Maritime Security Directive outlining specific, risk based measures mariners can take to detect, deter or disrupt piracy. All maritime interests, including Amver participants, are encouraged to read the directive and implement the recommendations. The United States Coast Guard is actively engaged in the fight against piracy. You can read Rear Admiral Brian Salerno's recent testimony on Coast Guard anti-piracy efforts here (link to pdf). Did you know Admiral Thad Allen, United States Coast Guard Commandant, is now officially on Twitter? You can follow him at iCommandantUSCG. The Commandant is truly committed to sharing information and transparency and Amver is happy to welcome Admiral Allen to the Twitterverse. If you are interested in seeing what other government leaders and organizations are on Twitter check out the GovTwit directory. Want to learn more about social media? Check out our previous post on social media. Now, when will the Commandant host a Tweetup? Will Amver be invited? Isn't amazing how fast the time passes? We can hardly believe its been another week. Over 30 vessels joined Amver in the last week. At the rate vessels continue to enroll we should see over 1,000 new ships joining Amver this year. Perhaps you are assigned to one of these vessels. If so, leave a comment and tell us a bit about your ship. Do you have a picture of your vessel? Email Benjamin Strong with your ship's photo and he will put it up on the blog. e-Rescue? Amver Notified Of Distress Through Twitter. 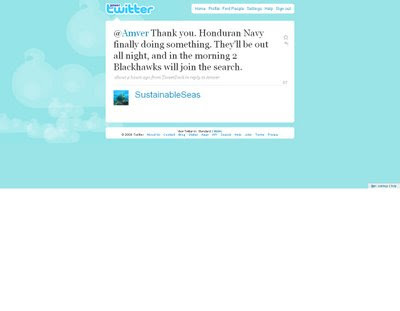 When Amver began using social media as a way to join the conversation we never dreamed something like Twitter would be used to notify officials of a search and rescue case. That is exactly what happened the other day when we learned of a distress through our Twitter account. 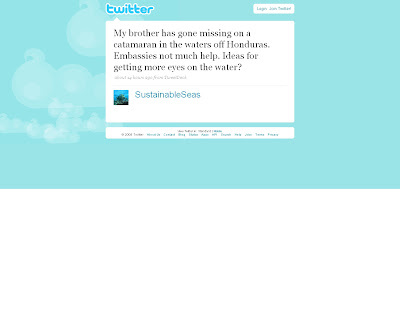 It all started when Twitter user @sustainableseas tweeted that his brother had gone missing off the coast of Honduras. One of Amver's Twitter followers, @megayachtnews, sent us a direct message sharing the original message. 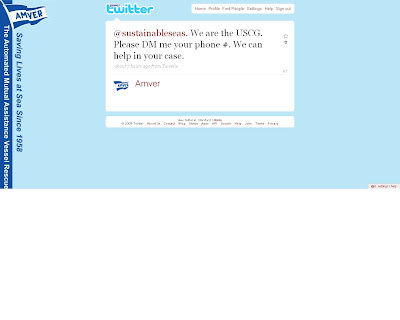 Not knowing if @sustainableseas had contacted a United States Coast Guard command center we reached out and encouraged him to send us his phone number. We talked to @sustainableseas and determined he notified the Coast Guard who handed the case over to Honduran authorities. We also gave him contact information for the Honduran command center. As of this post authorities were still searching. We hope the case resolves quickly. Government social media sites should be prepared for situations like this. Site managers should know how to route emergency requests. Emergency personnel should take requests for assistance through social media seriously. Do you work in a command center? What is the strangest notification you have received? In 2008 Amver embarked on a journey into social media. We established a Facebook presence, a Twitter account, a Flickr page, and a YouTube channel. Amver isn't alone. Following the example of United States Coast Guard Commandant Admiral Thad Allen, who maintains his own Facebook fan page and blog, we decided the world of social media would be worth exploring. 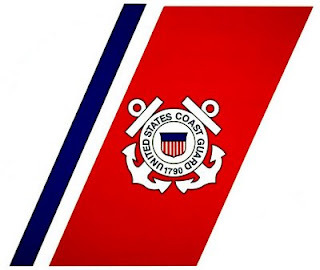 There are several other Coast Guard related social media outlets, most notably the Unofficial Coast Guard Blog, the official Coast Guard Twitter account, and several District blogs. Thinking of joining us? Want to learn more? Looking to improve your social media know how? Here are 10 suggestions that helped us. See how they can help you on your social media journey. Read Problogger for-what else-great information and advice on blogging. Check out Chris Brogan's blog for more social media advice. Listen to podcasts like Marketing Over Coffee, Media Hacks, or Managing the Gray to learn about useful social media applications, trends, and tactics. Check out Guy Kawasaki's post about using Twitter. If you are in government and considering implementing Twitter check out Bearing Point's government Twitter directory for government agencies using Twitter. Set up a Google alert for your brand, agency, or company to learn what people are saying about you. Attend a Podcamp. Podcamps are (usually) free "unconferences" where you can learn how to blog, podcast, or engage in other social media strategies. Government social media novices can check out Jeff Levy on Twitter. Jeff is the EPA's web manager and a government 2.0 strategist. Another good source for government social media advice is Dr. Mark Drapeau who regularly Tweets and writes about the evolving government social media culture in Federal Computer Week. Read other maritime blogs such as gCaptain or Sea-Fever to see how they are using social media. Ready to take part in the conversation? Let us know how you are employing social media in the maritime sector. What have you found to be most successful? Greek Captain Earns USCG Distinguished Service Award. 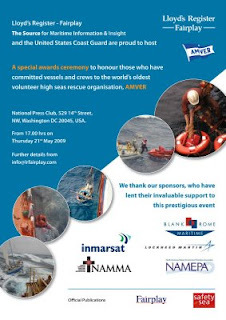 On Thursday April 23, 2009, the International Propeller Club of the United States, Port of Piraeus, in cooperation with the American Embassy in Greece, organized an awards reception at the Yacht Club of Greece to honor former Club president Captain Sava Kalafatides. Commandant of the United States Coast Guard Admiral Thad W. Allen presented the Distinguished Public Service Award to Captain Kalafatides in recognition of his work promoting the Amver system and awards in Greece. United States Coast Guard Commandant Admiral Thad Allen pins the Distinguished Public Service Award on Captain Sava Kalafatides. The President of the Propeller Club in Greece, Mr. Nikolaos Tsavliris, presided over the event and extended greetings and a warm welcome to Commandant Allen and guests. Mr. Tsavliris congratulated Captain Kalafatides for his continuous and valuable efforts to promote and encourage Greek owned fleet participation in the Amver program, leading Greece to the top position worldwide. Admiral Allen, upon presenting the highest award for U.S. public service to Captain Kalafatides, stated that Captain Kalafatides used his broad experience and convinced the Propeller Club, Port of Piraeus to work together with the U.S. Embassy to sponsor the Amver Awards. This partnership has helped Greece become the leader in Amver awards. Admiral Allen went on to say "...without Mr. Kalafatides's dedication to the Amver program, a cornerstone of the U.S. Coast Guard search and rescue system, the Amver system would not be as strong as it is today." United States Ambassador to Greece, Daniel V. Speckhard, also commended Captain Kalafatides for his contribution to the Amver system. Captain Kalafatides thanked all the members of the Propeller Club for their presence and acknowledged that this award was the result of a collective effort. He expressed his gratitude to Mr. George Angeles, former president of Propeller Club who he collaborated with to expand the Greek Amver awards. Captain Kalafatides also thanked, above all, the Greek ship owners, their executives, and crews who have committed themselves to safety and have embraced the Amver program. Captain Kalafatides (far right) accompanied by his son, wife, and Admiral Allen. We are pleased to see Captain Kalafatides, known affectionately as Kal, recognized for his efforts in promoting Amver. He is a tremendous friend of the program and we are thankful for his efforts. Yup, it's that time again. As we celebrate the latest members of the Amver family the maritime world continues to be in the news. There are Congressional hearings on piracy, the Maersk Alabama is about to begin service to Mombasa again, and the economy continues to take a toll on shipping. Is there a silver lining to this cloud? If so it must certainly be shipping's willingness to voluntarily participate in the only global search and rescue system. With that I introduce our new Amver participants. We would love to hear from you if you crew one of these vessels. Leave a comment from shore or while underway. What happens when the search and rescue alarm is sounded in your rescue coordination center? What happens when your command center receives a 406 EPIRB alert? You initiate your standard operating procedures, launch surface and air assets, check databases, and start making phone calls hoping for the best, right? What if we told you we could increase your search and rescue arsenal by over 3,500 surface assets in a matter of minutes? Hmm, did that get your attention? If you are an international rescue coordination center you should be taking advantage of the Amver online surface picture request form. The what? The Amver online SURPIC request form. What is an Amver surface picture (also known as a SURPIC)? Read here to learn more. The online request form is a web based feature offered by the Amver system that allows your rescue coordination center to quickly request Amver data for a specific location during actual maritime emergencies. Within minutes of making the request the United States Coast Guard Atlantic Area Command Center will forward real time Amver vessel data to you to assist in the resolution of your SAR case. So how do you request Amver data? Follow these simple steps and you are on your way to increasing your search and rescue resources exponentially. Click on the Request SURPIC button on the left side of the Amver homepage. Follow the instructions making certain to include contact information, nature of distress, distress location, and radius (if requesting a radial SURPIC). Enter validation text (helps us weed out spammers). Does the online request feature work? Just ask the search and rescue professionals at MRCC La Reunion, MRCC Hong Kong, MRCC New Zealand, or any of the other international search professionals who have requested Amver data for emergencies in their search and rescue regions. As search and rescue professionals we owe it to those in distress to increase the likelihood they will be rescued. Incorporating Amver data requests into your standard operating procedures doesn't guarantee a rescue, but it certainly increases the number of search assets. Remember, this request procedure is for professional rescue coordination centers only. The United States Coast Guard does not release Amver data to anyone other than RCCs for any reason other than maritime emergencies. Will your rescue coordination center start requesting Amver data? Have you used the SURPIC request form and have a success story to share? Tell us about it!